Data has become a buzzword that means different things to different people, but all organisations agree that understanding customer behaviour, sales performance, and information processes can build a platform for achieving business success. However, our reliance on data and the potential pitfalls associated with managing it have given rise to the need for safeguards for the protection of information, particularly in Europe where the General Data Protection Regulation (GDPR) will soon come into force. GDPR is designed to harmonise the current data protection regulations across EU member states, with strict data compliance stipulations and the possibility of huge financial penalties for those who breach of the rules. While the regulation doesn’t deal specifically with cloud service providers, it does have implications for organisations that use cloud services to store data. And with many companies in need of guidelines on how to deal with new approaches to data management, it’s time to turn to the experts. We spoke to a number of thought leaders based in Europe to get their view on the steps organisations should take to ensure data is managed correctly in the cloud when GDPR comes into force. Christian McMahon, CIO at three25, a technology business consultancy in the UK, said organisations should initially research how GDPR applies to their business, and benchmark their current level of compliance before detailing where change is necessary. Many may benefit from the appointment of a data protection officer, he said. However, he added that none of the above should affect a company’s move to the cloud. Adrian Bridgwater, an enterprise IT blogger for a number of B2B sites, including Forbes, agreed that many reservations over placing data into the cloud were misplaced, including fears over security. 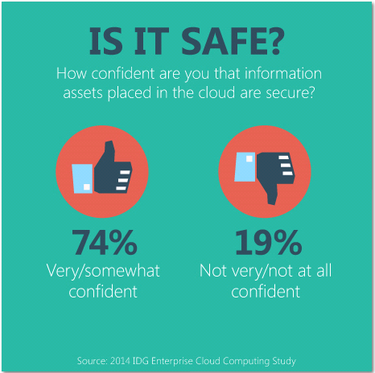 Indeed, confidence in cloud security is growing, according to the 2014 IDG Enterprise Cloud Computing Study. The survey found that the vast majority of enterprises were “very” or “somewhat” confident that the information assets placed in the cloud are secure. However, data regulation is likely to encourage many companies to take a hybrid approach, allowing them to separate the data from the application. That way the application resides in the public cloud, and critical data is stored on a private network, in theory giving companies more control. René Büst, Senior Analyst and Cloud Practice Lead at Crisp Research, said many CIOs are focusing on the issue of “data gravity” – the difficulty of managing and moving data as it becomes more important and intrinsically linked to the services and apps that rely on it. He said data gravity is an issue for organisations either because of the size of the data, or because of the legal conditions that require it to be stored in an organisation’s own environment. That way, data is not directly stored in the public cloud. Instead cloud services are accessing data stored in a private cloud via a direct connection only during the processing time. “The cloud is safe and will meet and exceed your requirements as long as your business takes reasonable precautions and decisions to manage and protect your data,” he said. Ultimately, all contributors agreed that companies should not use GDPR as a reason to delay cloud investments. Instead, they should find out the implications of data privacy regulations in order to embrace the cloud at their earliest convenience. Dale Vile, Research Director at IT analyst firm Freeform Dynamics, suggested anyone saying that their cloud computing strategy is being held back by privacy regulation is almost certainly using this as a smokescreen to hide other objections. “The reality is that privacy considerations simply do not apply to most cloud use cases, and even where they do, it’s perfectly possibly to work through the issues and find a solution,” Vile said.